A stunning clean face design with amazing versatility to complement contemporary or traditional décor combines with exceptional performance to make the Envy™ the perfect fit for your home. 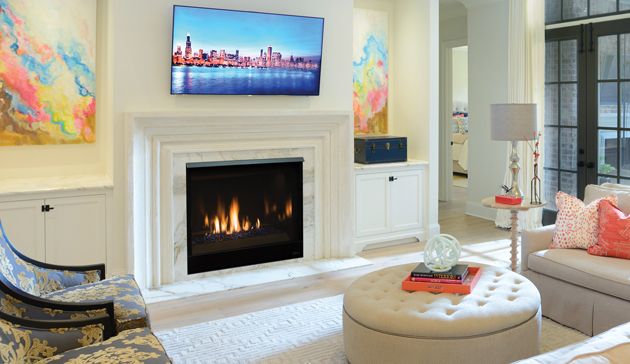 The Envy™ Direct-Vent Fireplace is sure to provide the perfect foundation for custom tailoring to your taste and home’s décor. Both looks offer an expansive ceramic-glass opening and patent-pending FullFlame™ dual burner technology for exceptional glow and flame appearance. With a wide array of optional accessories to personalize to your taste, the Envy provides endless possibilities for making your living area warm and inviting. Smooth-faced design features ceramic glass for optimum heat transfer. Available in Traditional (with log set) and Contemporary (with glass media) configurations. Exclusive Full Flame™ burner technology independently optimizes fuel mixture to generate superior glow and flame. Standard fireplace lighting illuminates interior with 6 distinct settings. Realistic Hi-Definition logs molded from actual firewood to deliver the look of natural fire. Massive viewing area combined with a ceramic glass enclosure panel provide an exceptional view of the fire. Contemporary units feature glossy black porcelain interior to amplify the look of the flame. Barrier integrates seamlessly with surrounding trim and provides an unobstructed view of the fire while providing an additional level of safety. Exclusive Full Flame™ burner technology combines a highly efficient combustion system with a greater range of control to optimize heat output. Full Flame™ multi stage burner and full function remote provide a total of 12 distinct flame settings. Hi performance modulating blower with noise canceling ducting for quietly delivering heat to the living space. Full function control features standing pilot mode for improved performance in extreme climates. Full featured modulating remote controls all fireplace functions as well as a smart thermostat mode for optimum comfort and efficiency. Dual burner technology for the ultimate flame control. Smooth porcelain interior liners complete the contemporary look while showcasing and reflecting the tall dramatic flame. Choice of five glass media colors to suit your taste and complement any home decor. Optional facades to further customize to taste. 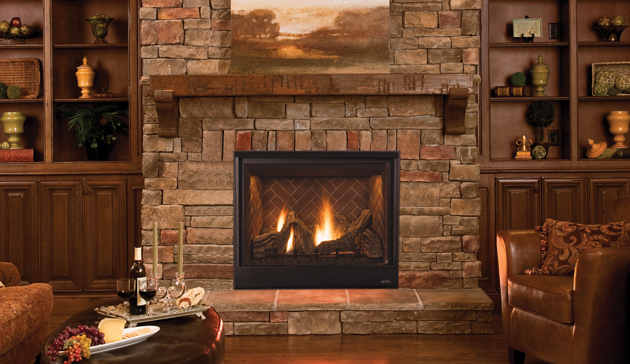 The Gemini™ direct-vent gas fireplace series warms up the room with a traditional log appearance and offers design versatility that will enhance any room. 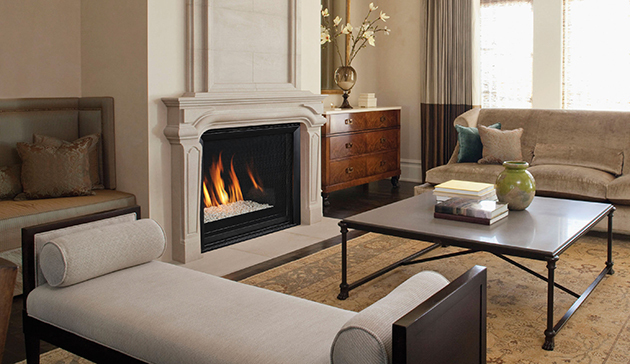 The newly designed Gemini™ series of direct-vent gas fireplaces projects versatile style and performance. Outfitted with inviting features and outstanding performance, these fireplace units also feature a number of optional accessories, allowing a personal, customized touch. The units are built with quality components and are easy to install. That’s the essence of the new Astria Gemini™ series. Select from four sizes – 33″, 35″, 40″ and 45″ – to accommodate the size of your room and heating needs. Oak logs and glowing embers deliver an elegant fire presentation. 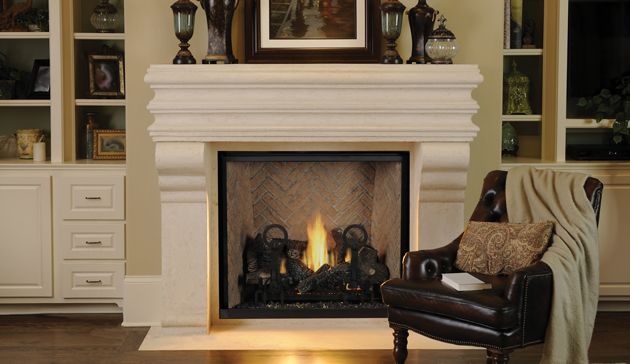 Clean, radiant design blend with any style of mantel or trim. Optional blower helps circulate warm air into a large room for maximum comfort. High/low flame control allows you to control the ambiance in the room for maximum comfort and enjoyment. Optional wireless remote controls deliver the ultimate convenience. Choose from Millivolt ignition system or energy saving intermittent pilot electronic ignition. Both systems provide reliable operation during a power outage. Added options like a wall thermostat or thermostat remote control for easy and trouble free operation. Standard IPI/CPI switch for easier operation during severe cold temperatures. Standard on/off and high/low flame control allows you to control the flame in the room from a conveniently located wall switch (provided). Easy access to control area without having to remove the safety barrier. Combo (top/rear) venting (except 33” models) for maximum installation flexibility. Approved for use in any room including bedrooms. Add an optional ceramic fiber brick liner for a more traditional look. A clean-face design with contemporary and traditional style options makes the Montebello® DLX a perfect fit for any home. The Montebello DLX Direct-Vent Fireplace offers the versatility and performance necessary to make it a stunning centerpiece for any home. With a traditional premium oak log set and five interior liners to choose from, the Montebello DLX can complement any style. The focal point of the Montebello DLX is its exceptionally tall, dancing flame seen through an expansive ceramic-glass opening for unmatched clarity and radiance. A vast array of accessories including several interior panel styles and optional andirons gives further ability to customize the look to add warmth and ambiance and value to your home. 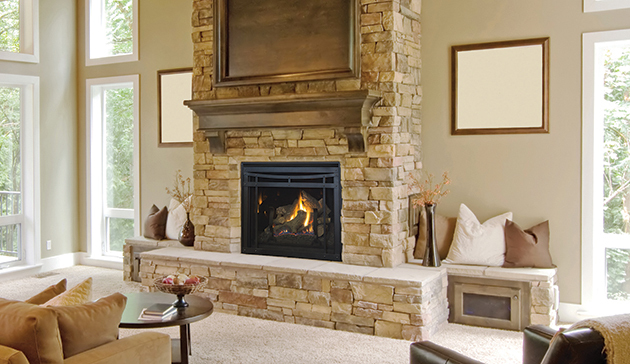 Choice of four realistic ceramic brick fireplace liners for the true look of masonry craftsmanship to complete the traditional look. Warm up the room with a Scorpio™ series direct-vent gas fireplace with Charred Oak or Driftwood log sets, and a standard heat circulating blower. The superbly designed Scorpio™ series is the embodiment of traditional style and performance. Dressed with an array of standard features including high efficiency ceramic glass and heat circulating blower, these fireplace units make a room both warm and inviting. Available in three sizes, the Scorpio series provides true design versatility. Select from 3 sizes – 35″, 40″ and 45″ – to accommodate the size of your room and heating needs. Charred Oak or Driftwood logs, decorative grate and glowing embers deliver an elegant fire presentation. Ceramic glass for superior clarity. Standard built-in blower kit enables higher efficiency and heat delivery to the living space. Ceramic glass provides more radiant heat than standard tempered glass. Energy saving intermittent electronic pilot ignition system reduces gas usage and provides reliable operation. Standard high/low flame control allows you to control the ambiance in the room. Uninterrupted operation even during a power outage. Combo (top/rear) venting for maximum installation flexibility. Select from a variety of required liners for a more customized look. Natural gas and propane models give you your choice of heating fuel. All applicable models comply with ANSI Z21.50/88 barrier requirements. Linear in design and stunningly multifaceted in effect, the Rhapsody offes a sophisticated, energy-efficient heating option for any installation that wants a modern feel. 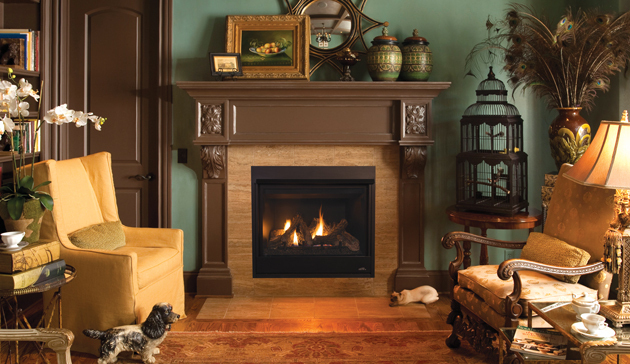 Combining the latest technology with sleek design, the Sirius gas-burning fireplace delivers on performance and style. 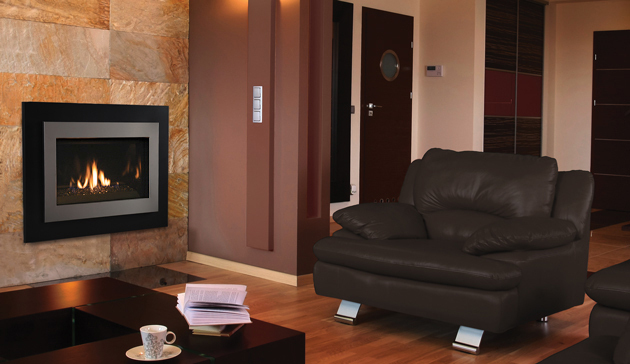 The Sirius fireplace brings together the latest in technology and design to provide the ultimate in versatility. 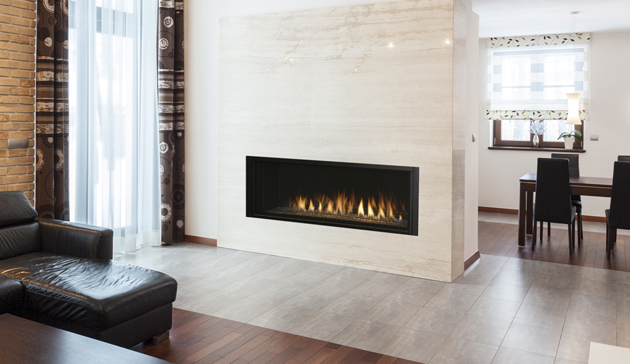 Its glossy, smooth porcelain interior showcases a mesmerizing band of flames, produced with advanced Infini-Flame™ technology for energy-efficient warmth. An array of contemporary media and surround options provides a sleek and stylish appearance that’s customizable to suit your taste and complement your home décor. The result is a modern fireplace that offers not only efficient warmth, but stunning beauty as well. 54- and 42-inch-wide designs create a breathtaking linear viewing area. 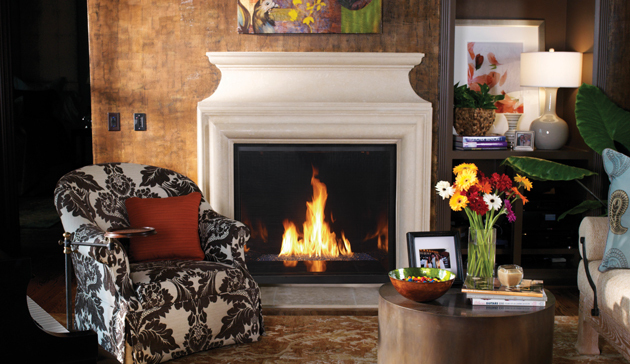 Infini-Flame™ technology produces a continuous band of soothing flames. Glossy, smooth porcelain interior provides a stunning backdrop and amplifies the look of the fire. Clean-face design offers a contemporary look that complements existing home décor. Infini-Flame™ technology produces energy-efficient heat. Ceramic glass provides optimum visual clarity, radiating warmth back into the living area. Five glass media options offer a variety of stylish looks to showcase the fire and complement your décor. 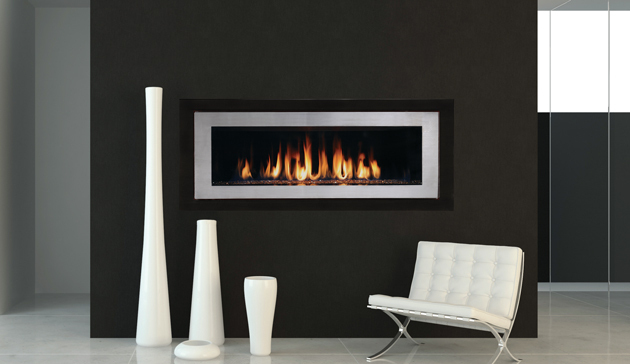 Optional surround in Black or Stainless Steel creates a sleek, contemporary frame for your fireplace. 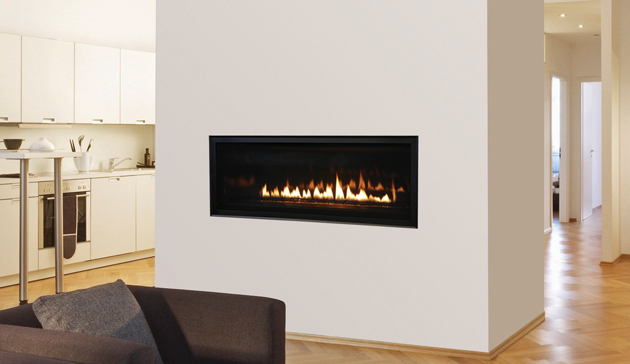 With its polished, straight line features, the Venice Lights direct vent gas fireplace is the epitome of modern versatility and tranquility. The Venice Lights direct vent gas fireplace is a versatile linear design for a dramatic appearance in a variety of room applications. Standard features include ceramic glass and in floor lighting to illuminate a variety of colorful glass pebbles. The expansive viewing area provides an uninterrupted display of the active flame pattern. Available in indoor or indoor/outdoor see through configurations, the Venice Lights provides endless possibilities for any modern living area.